Does Coconut Oil Cause Acne or Heal Acne? Dealing with the information as to whether or not Coconut Oil clogs pores or causes acne or makes acne worse is a concern for those currently dealing with acne problems. Sometimes anything with the word "Oil" in it conjures up fear for those that possess oily skin and have intermittent bouts of acne. Oil ingredients themselves are not necessarily the problem but can actually be the answer for oily skin types which in turn can help improve acneic skin conditions. 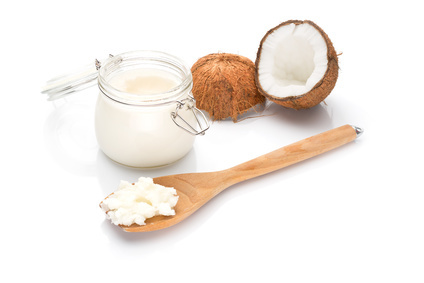 Why the confusion on Coconut Oil as it pertains to acne? Because there are those that believe it clogs pores and creates more acne, while there are those that believe it cleanses and softens sebum plugs on the skin, unclogging pores, whereby improving skin with acne. Whether it comes from an Esthetician, Medical Doctor promoting their own line of products, or your best friend, it will all depend on their belief of any ingredient they deem suspect creating a perfunctory list of the "bad" ones (natural or synthetic) without relating it to any scientific peer reviewed study to support their theories. Coconut oil is no different since what is lacking in their dislike for it, is the research to determine the accuracy of that dislike as it pertains to the variables in coconut oil processes. There are differences in coconut oil in fact, and it does matter in regard to those differences and the benefits skin can receive when using this ingredient by itself or mixed in your favorite skincare formula. Some claim the fractionated version of coconut oil is superior because they believe since it remains liquid at room temperature it won't clog pores. So their reasoning stands, the version of coconut oil which remains solid up to room temperature is what will clog pores because it is too thick and heavy. Unfortunately, this is not supported in science but simply a visual example of viewing them side by side. Since the human body is 98 degrees or higher then the solid form will never reach a level of thickness equal to what you see in a jar at room temp. So this reasoning does not fly, especially when an excellent unrefined version is the consistency of water once melted. Hardly pore clogging to say the least! It stands to reason coconut oil is simply misunderstood, since it's sourcing and the type being used will dictate the true benefits when applied to any skin type. There are many acne organizations and forums that swear by it's use for one's acne, and some not so much. Unfortunately, the different anecdotes don't always contain which form of coconut oil was used in their trial. Gaining an understanding into the different types used can assist someone when deciding on the best skincare product for their skin type and avoiding the pitfalls of choosing incorrectly. Unrefined coconut oil - also known as extra virgin, virgin or raw, is all about the process and the skin conditioning benefits it retains. But the only word to focus on is "unrefined" and the other descriptive used is for marketing. This is a pure oil that is extracted from fresh coconut meat rather than dried. The premium coconut meat used to make unrefined coconut oil goes through a preferred process called wet milling vs cold pressed. Enzymes are used to ferment, boil or separate the milk. The beauty of this process is it does not require bleaching or the use of additives. Also unrefined coconut oil through this type of process creates the highest level of antioxidants, and it retains its natural color, aroma and lovely skin nourishing nutrients one looks for in a good skin cream. Benefits are medium chain fatty acids such as lauric acid, capric acid and caprylic acid, along with a panacea of antioxidants and antimicrobial properties. Refined coconut oil - or also known as fractionated oil which remains liquid at any temperature, is made from copra, or otherwise known as dried coconut meat, that has been purified and deodorized with bleaching clay due to the levels of contaminants and the rancid smell that arise during the drying process. Some producers use chemical solvents to extract as much of the oil from the copra as possible or an expeller press. It is known to have a thicker consistency and from long ago was referred to as the poor man's oil or dirty oil. The medium chain fatty acid profile is reduced with the loss of acne fighting Lauric Acid, along with antioxidant properties which are destroyed and the skin benefits they offer. Many of your cosmetic grade coconut oil is in this category for skincare and may be why it contributes to acne. Outside of a nice emollient feel and a creamy texture it adds to the skincare product, it will not provide the skin nourishing benefits of it's unrefined counterpart. The bottom line is good quality Extra Virgin or Virgin Coconut Oil should still taste and smell like coconut. It should be a very fine, thin oil when melted, almost like water, yet remain solid below 76 degrees. The perfect oil should quickly melt in the palm of your hand with just your body heat. If it does not solidify as referenced here or melt quickly you'll know it is a much thicker and inferior oil. Extra Virgin Coconut Oil should be in a natural solid form like a bright white to off white with maybe a touch of gold when a natural filtering processing of the oil is used. A high quality coconut oil should sustain a shelf life of 2 years. How does this apply to skincare application? Due to the nature of the unrefined coconut oil, all of it's medium chain fatty acids, antimicrobial, anti-inflammatory, and antioxidant properties are retained. It works great for cleansing skin, moisturizing skin, soothing skin and actually unclogging pores that are plugged up by the much thicker sebum our skin produces. It can assist with balancing skin as well which can aid in reduction of pore clogging sebum which is a contributing factor of acne. The best part is, due to the antimicrobial benefit which comes from the lauric acid, coconut oil can kill the propionibacterium acnes and studies showed they were particularly vulnerable to lauric acid. Also whether or not you prefer "organically grown" in your products is a personal preference and does not effect the quality of the coconut oil. Can coconut oil have any negative outcome for those with an acne skin type? We aren't stating it can't cause acne for some, depending on it's process, but so can any other ingredient in nature by design or synthetically created in the lab. It will still be about trial and error for the individual and whether or not their skin has a propensity to clogged pores. The point we are making is nothing is ever black and white when dealing in opinions, but about research and then through studies determine which is the best fit for you. Be open-minded and don't allow those with an agenda to create confusion of certain ingredients based on a personal experience or ideology. Plus if the inferior coconut oil is what is used rather than the unrefined, comparisons would be inaccurate since the lesser in quality will create a thicker veil on the skin potentially clogging pores. Constant updating is necessary for research that becomes antiquated to more recent when available in this millennium. The modern comedogenicity tests on human volunteers are what is setting the standard, including virgin coconut oil. Both Dr. Draelos and Dr. Kligman, eminent and widely published dermatologists, prefer human tests as they are based on the actual use of the finished products as well as realistic concentrations of the ingredients in question in these products. In a randomized double-blind study (the gold standard of clinical studies on the comedogenicity of several oils commonly used in cosmetics concluded: “Despite years of being listed as comedogenic (in Rabbit Ear Assay ratings) — (virgin unrefined coconut oil) was shown to be non-comedogenic by DHSA (Draelos Human Skin Assays). This confirms what has been seen in clinics that regularly use Virgin Coconut Oil (VCO): It is a non-comedogenic mositurizer and antiseptic oil." ref; Kligman AM. Pathogenesis of acne vulgaris II.Histopathology of comedones induced in the rabbit ear by human sebum.Arch Dermatol.1968;98:58-66.
ref; Catambay, N, Villanueva, J, Verallo-Rowell, VM. Comedogenicity of virgin coconut and other cosmetic oils using a modified Draelos Protocol: a randomized double-blind controlled trial. In one study by scientists published in PubMed it demonstrated whether lauric acid can be used for acne treatment as a natural antibiotic against Propionibacterium acnes (P. acnes), which promotes follicular inflammation (inflammatory acne). This study evaluated the antimicrobial property of lauric acid against P. acnes both in vitro and in vivo. Incubation of the skin bacteria P. acnes, Staphylococcus aureus (S. aureus), and Staphylococcus epidermidis (S. epidermidis) with lauric acid yielded minimal inhibitory concentration (MIC) values against the bacterial growth over 15 times lower than those of benzoyl peroxide (BPO). The lower MIC values of lauric acid indicate stronger antimicrobial properties than that of BPO. In another study by scientists published in PubMed it evaluated the antimicrobial activity of lauric acid (LA) and its liposomal derivatives against Propionibacterium acnes (P. acnes), the bacterium that promotes inflammatory acne. First, the antimicrobial study of three free fatty acids (lauric acid, palmitic acid and oleic acid) demonstrated that LA gives the strongest bactericidal activity against P. acnes. However, a setback of using LA as a potential treatment for inflammatory acne is its poor water solubility. Then the LA was incorporated into a liposome formulation to aid its delivery to P. acnes. It was demonstrated that the antimicrobial activity of LA was not only well maintained in its liposomal derivatives but also enhanced at low LA concentration. Atopic Dermatitis study published in PubMed showed Atopic dermatitis (AD) skin is dry and readily colonized by Staphylococcus aureus (SA). Coconut and olive oils are traditionally used to moisturize and treat skin infections. A double blind study of 24 patients was done for 4 weeks. The results showed virgin coconut oil out performed the olive oil and could be useful in the treatment of atopic dermatitis colonization. As with any ingredient we present for review, we show the science in an unbiased manner. We do know this, with research and anecdotal evidence of success or lack thereof, it will still be about the ingredient profile that should be weighed when dealing with acne and when incorporated into a skincare cream or cleanser. What percentage is used in the formula is just as important as the ingredient itself. In full strength any ingredient can be too much for the skin, but combined with others for a skin loving balanced formula, it may provide just the correct benefit an acne prone skin type is needing. Rule of Thumb: Don't overwork your sensitive acne prone skin, but treat skin gently and your skin will love you for it.